For the 1960s dance, see The Jerk (dance). Jerkin' or Jerk is a street dance from Los Angeles. Since 2009, jerkin' has gained fans along the West Coast and, as of 2009, was gaining popularity on the East Coast. The dance itself consists of moving your legs in and out called the "jerk", and doing other moves such as the "reject", "dip", and "pindrop". The rap group New Boyz wrote and recorded a hit in Los Angeles entitled "You're a Jerk", while Audio Push wrote and recorded "Teach Me How To Jerk". As the jerk culture continues to flourish, several new groups specializing in the Jerk style are being courted and signed by major labels. Arista has signed the group The Rej3ctz, and the label is looking seriously at many other jerk groups that are flourishing on the Internet. As Jerkin' mainstreams, new dance crews and artists are competing and performing at events not only in Southern California, but spreading to other parts of the world. The Ranger$ crew not only competes in dance contests, winning numerous awards, but have recorded several songs and have been signed to a major label. Other notable crews in the Southern California area are Action Figure$, U.C.L.A. Jerk Kings, and the LOL Kid$z. People who jerk usually wear skinny jeans (varying from the unusual to the usual colors and washes), considered a rejection of the baggy pants style. Many elements of scene and the raver are used in the jerkin' movement, such as bright colored clothing, tight pants, or novelty graphic tees. Also people who dance the jerk wear hightop or retro shoes, including Chuck Taylor and Nike hightop shoes. Shoes may or may not be multi-colored. ↑ Reid, Shaheem (2009-07-13). "New Boyz Say They're More Than Just Jerkin' Rappers - News Story | Music, Celebrity, Artist News | MTV News". Mtv.com. Retrieved 2010-06-06. ↑ Comments (35) By Jeff Weiss Thursday, Aug 6 2009 (2009-08-06). "We're Jerkin (Starring the New Boyz, J-Hawk and Pink Dollaz) - Page 1 - Music - Los Angeles". LA Weekly. Retrieved 2010-06-06. 1 2 "'Skinny Jeans Movement' Bringing Jerkin' Online". News.tubefilter.tv. Retrieved 2010-06-06. ↑ Roberts, Steven (2009-07-29). 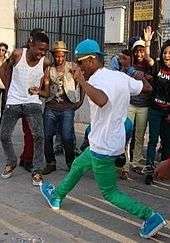 "New Boyz Challenge Chris Brown To A Jerkin' Competition - News Story | Music, Celebrity, Artist News | MTV News". Mtv.com. Retrieved 2010-06-06. 1 2 "Jerky boys and girls: New Boyz, Rej3ctz and more lead a new youth movement". L.A. Times Music Blog. June 12, 2009. Retrieved December 18, 2009.